Mumbai : INS Chennai, a P 15A Guided Missile Destroyer, was commissioned into the Indian Navy by defense minister Manohar Parrikar at an impressive ceremony held at the Naval Dockyard, Mumbai today. The event marks the formal induction into the Navy of the third and the last of the three ‘Kolkata’ class destroyers, indigenously designed by the Indian Navy’s in-house organisation, Directorate of Naval Design and constructed by Mazagon Dock Limited, Mumbai. 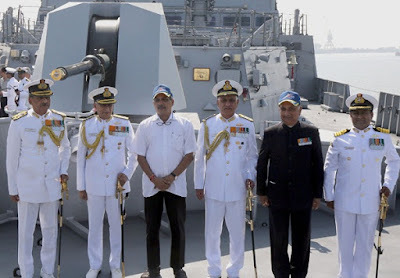 On his arrival, the Defense Minister was received by Admiral Sunil Lanba, the Chief of the Naval Staff and was presented a Guard of Honour by the ship’s crew. The ceremony was witnessed by a large gathering which included several dignitaries and senior officials from the government and all three services. Defense Minister Manohar Parrikar, whilst addressing the gathering, termed the commissioning of INS Chennai, last of the Project 15 A class Destroyers, as a historic day for the Indian Navy as it adds another milestone in our relentless journey towards achieving self reliance in battle readiness. The ship represents a significant ‘coming of age’ of our warship building capability and defence preparedness, said the Defence minister. He further stated that the Indian Navy, in addition to providing overall maritime security to our country, also plays a crucial role as the ‘net security provider’ in our adjoining seas. In this regard, Parrikar also stressed that the Navy’s growth and development must keep pace with the nation’s growth and maritime security needs. Lauding the role played by the naval designers (DGND) and the ship builders i.e. M/s MDL Mumbai, the Defense Minister said “with the induction of INS Chennai, a new benchmark has been achieved for our warship design and construction endeavours, with the sophistication of systems and equipment, and utilisation of advanced ship building techniques”. During his address, Admiral Sunil Lanba the Navy Chief said that commissioning of INS Chennai marks another milestone in the Navy’s quest for self-reliance as it signifies completion of the challenging Project P-15A and heralds a new era of advanced warships built indigenously by Indian shipyards. The Admiral also stated that indigenisation of platforms, weapons, sensors and equipment with participation of public as well as private sectors, will continue to remain a focus area of the Indian Navy, in line with the ‘Make in India’ policy enunciated by the Prime Minister. He emphasized that the ‘Roadmap for the Navy’s expansion and growth would continue to remain firmly anchored on Self-reliance and Indigenisation’. The ship measures 163m in length, 17.4m in breadth with a displacement of 7500 tonnes and can rightfully be regarded as one of the most potent warships to have been constructed in India. The ship is propelled by four powerful Gas Turbines, in a Combined Gas and Gas (COGAG) configuration, capable of achieving speeds in excess of 30 knots. The ship has enhanced stealth features resulting in a reduced Radar Cross Section (RCS) achieved through efficient shaping of hull, full beam superstructure design, plated masts and use of radar transparent materials on exposed decks. INS Chennai is packed with contemporary and sophisticated ‘state of the art’ weapons and sensors such as Surface to Surface Missile and Surface to Air Missiles. The ship is fitted with a modern Surveillance Radar which provides target data to the gunnery weapon systems of the ship. The ship’s Anti Submarine Warfare capabilities are provided by the indigenously developed Rocket Launchers and Torpedo Launchers. The ship is equipped to fight under Nuclear, Biological and Chemical (NBC) warfare conditions. A unique feature of this ship is the high level of indigenisation incorporated in the production, accentuating our national objective of ‘Make in India’. Some of the major indigenised equipment/system onboard INS Chennai include Combat Management System, Rocket Launcher, Torpedo Tube Launcher, Automated Power Management System, Foldable Hangar Doors, Helo Traversing system, Auxiliary Control System and the Bow mounted SONAR.